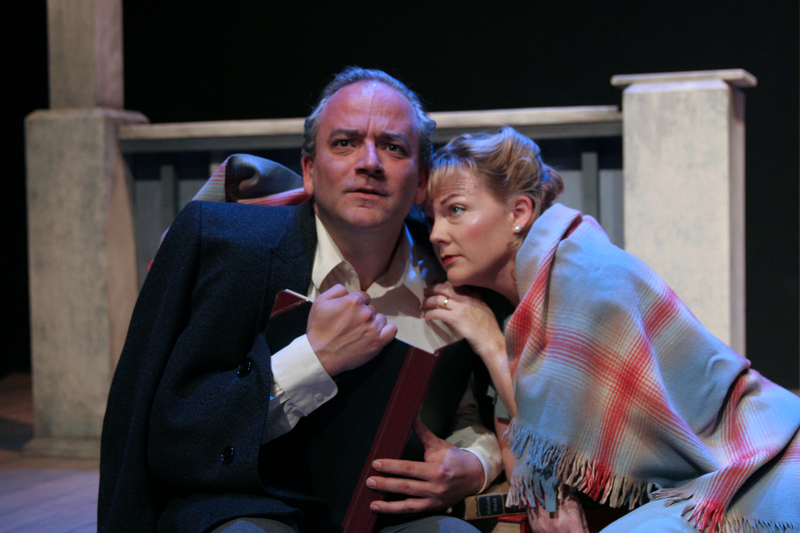 (from l to r) Dale Albright and Cynthia Lagodzinski in Thornton Wilder’s “The Skin of our Teeth.” Photo Credit: Douglas Morrisson Theater. Watching the opening night performance of Thornton Wilder’s “The Skin of our Teeth” at the Douglas Morrisson Theatre in Hayward, I notice the small audience turn from laughter, to chuckles, to dead silence. And one could say that is how this well-meaning, but ultimately over-ambitious production of Thornton Wilder’s masterpiece turns out. Yes, this play is a genuine masterpiece, and deservedly won the Pulitzer Prize for drama in 1942. It is an impressive allegory for the human race, its capacity for good and evil, and its insistence on continuing forward. The play consists of three one acts featuring the same family over the course of both six months and six thousand years. It is a play that, like the author’s previous and more famous “Our Town,” demonstrates the uniqueness and continued necessity of live theatre. Director Susan E. Evans wisely chooses to present the material as written. With concept productions of classics seeming to be all that goes nowadays, it is a relief to see the director trust the material instead of twisting it to fit her own stamp. The original music by Don Tieck is atmospheric and melodic. The play is not easy to pull off, requiring a tricky balance that demands almost instantaneous tonal shifts for the whole piece to work. In the present production, most of the humorous bits land well, which makes for a highly amusing first act. However, the second act requires the actors to balance between comedy and drama, and this company fails to find the seriousness in the work, replacing what should be genuine emotion with loud shouting. This causes the dramatic bits to be lost in a flurry of noise, while preventing the still persistent humor from shining through. These difficulties are made worse by problems with vocal projection. Some lines were lost to me, even though I was only three rows from the stage. Either microphones or improvements in diction should have been called for. The set design, too, is overly ambitious, with large set pieces that ultimately take away from the raw nature of the play and are none too appealing to boot. The final act should be profoundly moving, but ends up stupefying instead. The actors try hard, but seem unable to rise to the level required. The words wash over the audience, who seem to just sit and wait for it to be over. Although this company has made a great effort, this production is a case of their eyes being wider than their stomach. The company has not digested this material successfully enough to create a satisfying evening of theatre. I applaud the attempt, but, unfortunately, it just isn’t good enough. “The Skin of Our Teeth” plays at the Douglas Morrisson Theatre in Hayward through June 14th. For further information, click here. “The Skin of Our Teeth” by Thornton Wilder, produced by Douglas Morrisson Theatre. Director: Susan E. Evans. Assistant Director: Mariana Wolff. Scenic Designer: Martin Flynn. Lighting Designer: Christopher Booras. Original Music and Sound Design: Don Tieck. Costume Designer: Courtney Flores. Sabina (aka Lily Sabina Fairweather), Miss Somerset: Lauren Hayes. Mr. George Antrobus: Dale Albright. Mrs. Antrobus: Cynthia Lagodzinski. Henry: Alan Coyne. Gladys: Wendy Wyatt-Mair. Fortune Teller: Eve McElheney Tieck. Announcer, Mr. Fitzpatrick, Ensemble: Reg Clay. Dinosaur, Broadcast Official, Ensemble: Caitlin Evenson. Mammoth, Miss T Muse, Ensemble; Radhika Rao. Telegraph Boy, Chair Pusher, Ensemble: Jon Wat. Miss M Muse, Ensemble: Laurie Gossett. Homer, Ensemble: Wayne Roadie. Piano and Percussion: Donald Tieck. Glockenspiel, Percussion, and Sound Effects: Jim Patrick. Cello and Percussion: Eve Tieck. Posted in Reviews.Tagged Charles Kruger, Doulas Morrisson Theatre, Mark Johnson, San Francisco Theatre Reviews, The Skin of our Teeth, theatrestorm, Thornton Wilder.